Should I save bubbly for special times? It’s like the veg way of messing up. Tofurk-ing up. My mom was critical of my expletives so I’m exploring my alternative options. Bear with it. I funked it up on the sharing part but I was sent two Rotari samples, one white and one rosé and…I love rosé and…I was stressed and…okay look I opened it and said to myself “If I finish it a day or so later it may have less bubbles but what the fudge I want it now. I will share the brut later but I want the rosé NOW. I was SO excited for this because WHAT?! It is grapes made into bubbly just like Champagne but…Italian. To be more specific, it’s bubbly from Trentodoc, the second oldest sparking appellation after Champagne. Like Champagne they make their sparkly from Chardonnay and Pinot Noir–Champagne also sometimes includes Pinot Meunier but this bubbly sticks with the first two. Like Champagne the base wine is made and bottled then more yeast and sugar is added to create a second fermentation. At some point after the potion rests on the dregs of exhausted yeast there is disgorgement: all the sediment of the leftover yeast is expelled. Perhaps a small dosage of wine n sugar tops it up. A cork, cage and foil are added and it’s off to the races. Or to the bloggers. Whichever. That is “traditional method”–or in this case “metodo classico”–sparking wine! It’s a lot. But! Does it taste good? Okay holy frug. Here are my happy thoughts. Pale, pink-salmon, fine light bubbles. Nose: raspberries strawberries cherries all the red berries + Wet rocks n yeast. 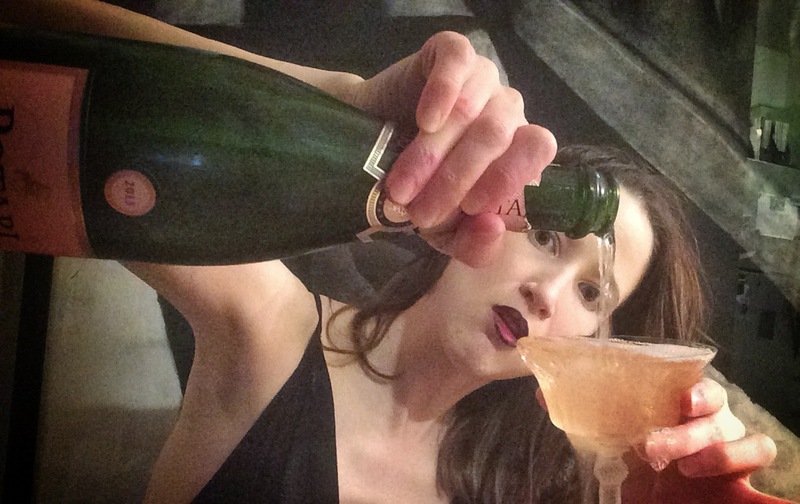 On the tongue (everyone’s favorite organ): oh the effervescence of a traditional method bubbly! Transfer and tank method cannot surpass the elegance of the bubbles, and this traditional method has all the right stuff. Them’s the high-labor high-price breaks. High dang acid, medium alcohol, And the flavors oh right those! In addition to those delightful wet stones you get the very light hints of brioche that come from so much time sitting on the lees. That is, the yeast remains. Those are the lees. It really is a whole lot of strawberry and raspberry and stone and as I said the brioche. So like butter and yeast and cream. My favorite bread and fruit products, usually eaten separately now combined into a sublime beverage.